Trump is no fan of Amazon, and he often broadcasts this on Twitter. It’s well established that the online retail giant has grown at the expense of brick-and-mortar shops. But is Amazon paying little or no taxes to states and local governments? Is it causing the U.S. Postal Service to bleed money? Two things before we dive in: The Washington Post has been owned since 2013 by Jeff Bezos, the chief executive of Amazon, as a personal investment via Nash Holdings LLC. And Trump’s tweet came days after Axios reported that the president has discussed changing Amazon’s tax treatment, arguing that the company gets too many breaks from taxpayers. This applies only to what Amazon sells directly to online shoppers. Third-party vendors that use Amazon’s website to sell their own merchandise account for roughly half of items sold, but the company requires them to charge sales taxes only in Washington state, and beginning April 1, in Pennsylvania. In other states, Amazon doesn’t require but offers to collect sales taxes for third-party vendors. Asked about Trump’s tweet, an administration official pointed to this tax-free setup for most third-party vendors using Amazon’s website. It’s important to note that none of this is part of Amazon’s own tax burden. The company collects the sales tax and remits it to the state and local governments. But the dynamics here are important, because in places where it does not collect sales taxes, Amazon typically enjoys a competitive edge over traditional retail establishments, and local governments would not generate revenue from its sales. Amazon itself paid $957 million in income taxes worldwide in 2017, according to a regulatory filing. It paid $412 million in 2016 and $273 million in 2015. Separate figures in the report show it was expecting to pay $100 million to $200 million in taxes at the U.S. state level in 2017. Amazon’s warehouses and other facilities require lots of jobs, which is a big reason that states and local governments have given the company generous tax breaks and other perks. A 2016 report found that Amazon got at least $613 million in subsidies from local governments for its package facilities from 2005 to 2014, plus another $147 million for its data centers. According to Good Jobs First, Amazon subsidies have reached at least $1.39 billion. On top of this, the company may get a historic tax-break package when it chooses a site for its second headquarters. Newark, N.J., for example, has offered $7 billion in state and local tax breaks as part of its bid. Chicago has offered at least $2 billion. A representative for Amazon declined to comment except to say the company collects billions of dollars in sales taxes every year. Ironically, Trump’s signature legislative achievement, the Tax Cuts and Jobs Act, lowered the corporate tax rate from 35 percent to 21 percent and gave Amazon a $789 million windfall in 2017. Because of several tax moves, Amazon ended up paying no federal taxes in 2017, according to an ITEP analysis. But Amazon says the relationship is mutually beneficial. In 2017, the company noted that the Postal Regulatory Commission “has consistently found that Amazon’s contracts with the USPS are profitable,” The Washington Post’s Brian Fung reported. The Postal Service declined to comment on Trump’s tweet. Amazon uses the Postal Service for the last mile or so of a package’s journey. The Postal Service in a recent regulatory filing described such arrangements with online retailers as a synergy. Amazon’s tax strategies have rankled the president, but you would know this only from his tweets and comments because the tax bill he signed in 2017 gives the online retailer a $789 million windfall. Trump says Amazon pays “little or no taxes” to state and local governments, but the facts say otherwise. The online retail giant clearly leverages many tools to keep the taxman at bay. That doesn’t erase its state and local tax bills. These are larger than Trump allows. The president says the United States loses money because Amazon relies on the Postal Service for the last leg of its package deliveries. The Postal Service reported a net loss in 2017, and it does offer Amazon cut rates. But that’s not the whole story. In fact, e-commerce deliveries are one of the post office’s few thriving lines of business. 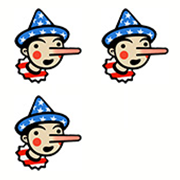 Amazon is one of the biggest companies in the world, and its financials are fair game for critics, but Trump’s distortions don’t add up and are worthy of Three Pinocchios. "I have stated my concerns with Amazon long before the Election. Unlike others, they pay little or no taxes to state & local governments, use our Postal System as their Delivery Boy (causing tremendous loss to the U.S.)."